Encourage and support efforts to plan for housing and community development, especially in relationship to the provision of shelter, human needs and the development of the built environment. Establish useful relationships among professionals in planning, public administration, social work, health care, education, government, and research who share a common professional interest and affiliation with planning for housing and community development. Provide for the exchange of information and ideas among members about planning for housing, community development and human services. Educate other planning professionals and practitioners about the importance of the social and human services dimensions of planning, as well as technical innovation in the development, implementation and evaluation of housing and community development plans. 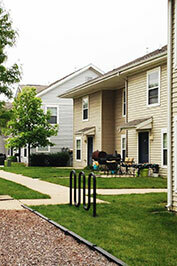 Report on research activities related to planning for housing and community development. In addition to publishing semi-annual newsletters, and monthly e-blasts, the division sponsors sessions and workshops at national, regional, and state conferences, as well as webinars. We also maintain a permanent national position through the Housing Track at the APA annual conference. We support the Outstanding Planning Student Organization awards program recognizing outstanding work by up and coming planners. We also assist APA with their Policy and Advocacy function by bringing experts in the housing and community development field to help shape policy on the national and local levels.